Social media insights are not only helping GE Capital’s Australian team better understand how customers relate to its products and services, they’re also driving more targeted, real-time marketing campaigns. 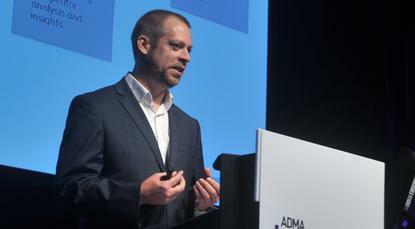 At the inaugural ADMA Techmix conference in Sydney last week, GE Capital’s social media lead analyst, Leigh Price, outlined several ways the B2B organisation’s recently established digital centre of excellence is actioning social media insights. GE Capital is GE’s money and personal loans business. Price is part of a global pilot in Australia launched two years ago to trial a dedicated digital centre of excellence and build a social media analytics and insights capability framework. Under the social media insights framework, Price’s team listens not just to mention of brands, campaigns and competitors on social channels, but also category discussion, individuals recognised as experts or influencer in the products space, and positive and negative drivers at a category level. The data from these listening activities is then rolled into lead metrics, including qualitative indicators such as customer conversation, category conversation, brand conversation, competitor, as well as quantitative metrics, such as volumes, trends, channel split, share of voice, sentiment, influencers, and our own channel performance. The first example Price shared of using social media insights on its 28 Degrees Mastercard was around expanding the product’s scope beyond its core travel audience. Through CRM data and card usage, GE knew some customers were also using the card for online purchases to avoid transaction and conversion fees. “We sliced that data into the context of social conversations and how people talked about the card. We had a volume of people talking about the card only for online shopping, and a bunch talking about it for travel, and those neutral queries in the middle, which are mostly customer service queries,” Price explained. “We were surprised at the high level of discussion about online shopping, and also surprised to find that when we segmented data, the positive conversations about the card were far stronger and exhibited more advocacy when using the card for online shopping, versus travel. To target that audience, GE had developed automated lifecycle emails explaining the benefits of using the card for online purchases, but Price said it could see the opportunity to drive messaging further. “We began experimenting on changing the message on social channels purely from pushing travel to talking about online shopping benefits. We also used social analytics to identify the most influential sources where people were talking about the card for shopping, and we targeted those sites with tactical ad campaigns,” he said. As a result, GE saw the graph in conversations around the product spike when it started talking about the online benefits via social, Price said. “We saw a big impact when we started changing messaging. That’s a great insight for us,” he said. Another way Price’s team uses social insight is by uniting influencer data with Web analytics. He pointed out most analytics platforms include an influencer algorithm that shows the influence a user in terms of retweeting and sharing, along with blog sites and forums. “This data can be good on its own, but where it gets interesting is when you mix it with Web analytics data,” Price said. “When we were trying to change our messaging from travel to an online shopping discussion [with the 28 Degrees card], we used social analytics to split out blogs and conversations only talking about the card in a shopping context, then brought in Web analytics data to crossover the value of the conversion traffic each blog was giving us. Through this activity, GE Capital could see that although some sites were more influential, there was a distinction between what generated brand awareness versus a direct conversion. Price said GE used this combined data to strike a balance between which influencers it endeavoured to reach out to, and getting quality conversion traffic. A third way GE is tapping using social insights is to respond to competitive trends. Price said his team has identified groups of people passionate about travel money products and services, such as frequent flyers, through social data. These conversations also allow GE Capital to identify people talking about market research, focus groups or direct campaigns they were being targeted with. In one instance, GE became aware of a competitor conducting market research on a new fee structure that it suspected would trigger negative social commentary. GE uses similar insights analysis when it introduces major fee changes or restructure its own products, Price said. “We’ll listen very closely on social and try to be nimble on our site to deflect service queries,” he added. Through word cloud visualisations of social conversations, GE has also started better identifying what causes peaks in conversation. “Digging down into these unusual peaks to individual posts is often the beginning of a good insight,” Price claimed. One seemingly unpredictable spike was identified around the price protection feature of GE’s 28 Degrees travel credit card. “Analytics of the word clouds revealed the launch of new smartphone models was driving peaks in conversation around price protection insurance,” Price said. “What the tech savvy audience had realised was the price of these phones drops after a few months and their thinking was you could buy today’s smartphone at tomorrow’s prices with our feature. “We began using that insight as a tactic within our marketing campaign. So if a customer is digitally savvy and has contacted us through digital channels, we’ll use that smartphone example for that segment to market this offering. Price attributed the success of the global digital and social initiative on analytics, data and marketing collaboration. It’s also important insights are shared across the wider business. Priced explained social insights at GE are collated into a weekly “brand snapshot”, illustrating what has been popular on social channels, how GE has reacted to that information, where discussions suddenly peaked, and the performance of social campaigns. A more insights-driven report is produced monthly. “This is also a good opportunity to take a good sample size, extract it and see patterns that can’t always be identified easily through some social tools,” Price said. Quarterly reports then look beyond GE brands to competitors and focus on missed opportunities on a competitor’s part and where GE can take advantage, or where the company’s competitors were stronger, Price said. In addition, GE has created a crisis reporting framework which includes hourly reporting to key business and communications teams based on trends and topics driving conversations in a crisis. “Similarly, if an uncharacteristic peak in negative conversations occurs, our social service manager is notified in real-time,” he said. Two years into the pilot, Price said both the digital centre of excellence and social insights framework had been well received. “After the first nine months, other divisions across GE sat up and took notice and we’re now helping other regions to set up a similar program as well,” he added.